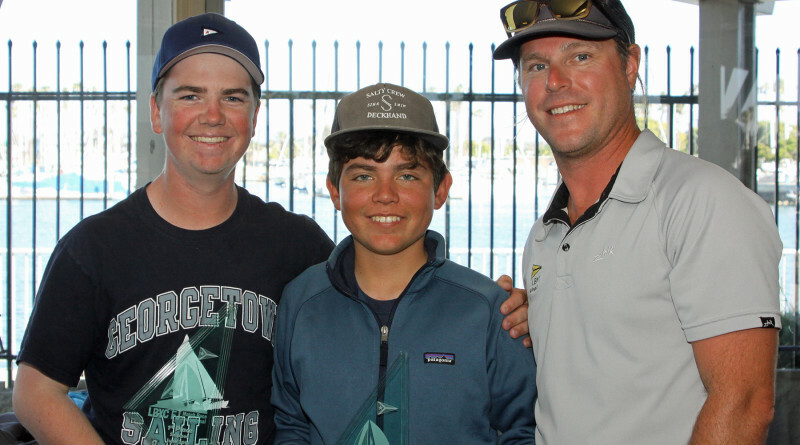 Jack Reiter, at left, and Jack Egan, center, show off their trophies with PRO Jess Gerry after winning the 2016 Long Beach Yacht Club Junior Match Race Invitational. LONG BEACH — San Diego Yacht Club’s Jack Reiter became a back-to-back winner June 4 in Long Beach Yacht Club’s 2016 Junior Match Race Invitational. 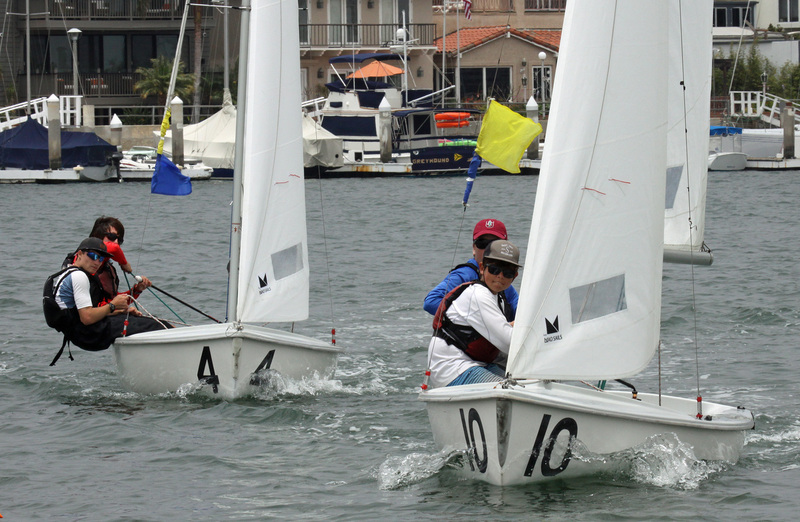 Eight Southern California skippers were invited to the race sponsored by Kaenon and sailed in Long Beach YC’s fleet of Collegiate FJs, with the requirement of a minimum age of 10 years and a maximum age of 18. 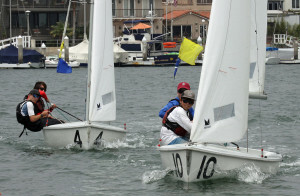 One skipper withdrew at the last minute, leaving seven to race the single round-robin match racing format which took place inside Long Beach’s Alamitos Bay Marina. While most of the western states are enduring a searing hot spell, Long Beach benefited from a morning overcast that kept the temperatures in the low 70s with breezes of 6-10 knots, even after the sun came out mid-afternoon. Jack Egan, who crewed with Reiter, is a good friend and skilled sailor in his own right who made the chemistry work for the team. Taking second place on a tiebreaker with Reiter was Santa Barbara Yacht Club’s David Eastwood and Christopher Kayda. Principal Race Officer for the regatta was Long Beach YC Sailing Director Jess Gerry. The inspiration for the regatta came from Long Beach YC’s past Junior Commodore Jack Berg who raced in the inaugural regatta in 2013. Final Race Results: 1st: Jack Reiter/Jack Egan, San Diego YC, 6-1 on tiebreaker; 2nd: David Eastwood/Christopher Kayda, Santa Barbara YC, 6-1; 3rd: Jack Joslin/Peter Joslin, SDYC, 5-2; 4th: David Wood/Catherine Reynolds, Balboa YC, 4-3 on tiebreaker; 5th: Gavin McJones/Maia Dastur, California YC, 4-3; 6th: Trent Turigliatto/Christina Van Dyke, Long Beach YC, 2-5; 7th: Ansgar Jordan/Audrey Mahowald, Cabrillo Beach YC, 1-6; 8th: Sawyer Gibbs/Roxy Snyder, Alamitos Bay YC, 0-7.